Creativity courses through these pathways of progress, amplifying networks of meaningful acts, linking and leveraging whatever we consciously choose to design. Design is a vast continuum. It spans the creation of innovation products, services, and environments to complex systems and dynamic processes. At its furthest frontier, it generates resonant ways of being and transformative shifts in consciousness. When we enter into mutually beneficial gyres of respect and reciprocity, we build organizational and natural alliances designed to transcend sequential transactions and support cooperative exchanges. 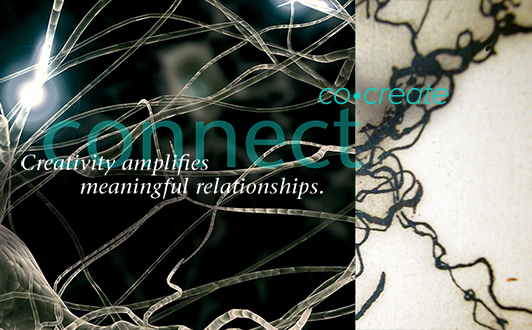 We shift from a paradigm of resources to one of relationships. Were we meet—we manifest. Systemic solutions to poverty, disease, war, and water. Strategies to enable women’s rights, global infrastructures, renewable energy, and caring economics. Scenarios to promote education, equality, and empowerment. Stores to inspire peace, partnership, and potential. Creativity manifests all manner of miracles. Are we willing to cease our struggling and surrender to the wondrous mystery? This text is excerpted from Born to Create, a meditative manifesto on creativity and an invitation to co-design a life-giving world. To schedule Lauralee Alben to deliver this interactive keynote, contact us. Continue reading this 5-part blog post. This entry was posted in Business, Creativity, Design, Humanity, The Great Transition and tagged #BornToCreate, creativity, design, Lauralee Alben. Bookmark the permalink. Both comments and trackbacks are currently closed.